We have known each other for quite some time, and I was delighted in my new position to be reminded of your enduring commitments—to students, to great journalism, and to causes that matter in the workplace. Based on my experiences at Hunter, accurately described over the course of several years in this blog and in other forums, I became a volunteer with New York Healthy Workplace Advocates (http://nyhwa.org). NYHWA is lobbying for a workplace anti-bullying law, which essentially bolsters discrimination laws already on the books but adds an extra layer for non-protected classes. Protected classes legislation make it illegal for an employer to discriminate on the basis of race, color, creed, age, perceived age, national origin, alienage, citizenship status, gender (including sexual harassment), gender identity and expression, sexual orientation, disability, marital status, partnership status, pregnancy and caregiver status. But they have holes and they don’t do much for those who not in protected classes and who are being harmed by workplace discrimination. I started a moveon.org petition supporting the NYS bill – https://goo.gl/uK0cM6 – and that link networked me to supporters of similar bills in other states. The activists with whom I work with in other ares of the country believe that New York and Massachusetts have the strongest chances of getting a bill passed this spring. If one or both happen, we are hoping those successes will influence other legislatures to pass similar bills. We’re hoping for a cascade since every state in the country has a bill pending and the northeast seems to have the best shot getting things going. But there is a downside. And I need to address that in coming posts. 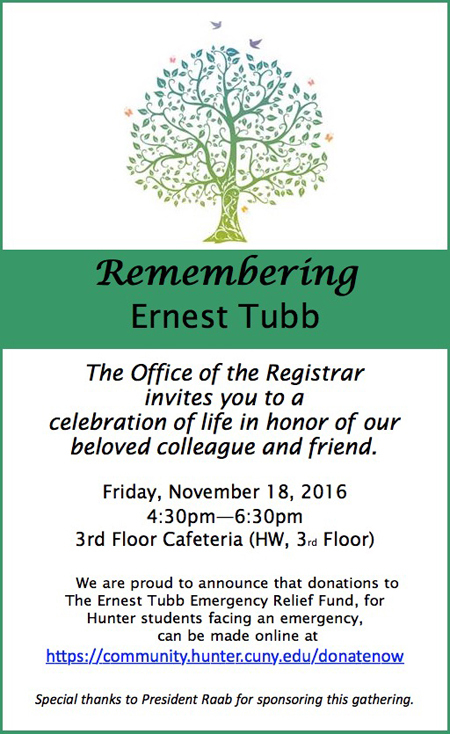 Ernest Tubb, who worked in the Office of the Register, was one of those Hunterites I respected and who have helped me a lot dealing with academic sleaze. I recall one incident when a student who had failed a class I taught was surreptitiously given a passing grade without my knowing. A Colleague, my chair and an assistant dean had signed off giving the student a passing grade that he didn’t deserve. Ernie helped me discover this academic blindsiding and was a help for many years. …And they will hit 1000! You are currently browsing the The WORD Blog blog archives for November, 2016.